The fourth test launch of the Magdeburg Rocket, which was actually the most successful of the early tests despite only traveling 300 meters–horizontally. The last ten years or so have seen China tentatively begin exploration of the Moon, culminating as of this writing with the lunar rover Yutu, which trundled around the Mare Imbrium until felled by the cold of the lunar night. Several features on the Moon have been named after Chinese deities or scientists, but one peculiar one straddles both definitions. On the lunar far side lies the crater Wan-Hoo, named after a man often credited as the first to ride a rocket. It’s likely that he never existed, as the first mention of his trip (which is supposed to have begun and ended in an explosion and his death) dates to the publication of the book Rockets and Jets in 1945. Author Harold Zim claimed that Wan-Hoo had done it sometime in the 16th century. An older version of the story, which uses the name Wang Tu, was printed in Scientific American in 1909. After that the trail runs cold. That does lead to an interesting question: what was the first serious attempt at making a rocket for a person to ride? The first successful attempt was Sergei Korolev’s Soyuz rocket, which launched Yuri Gagarin in 1961—a bit surprising, as not only did he do so, he reached space, and not only did he reach space, he reached orbit. 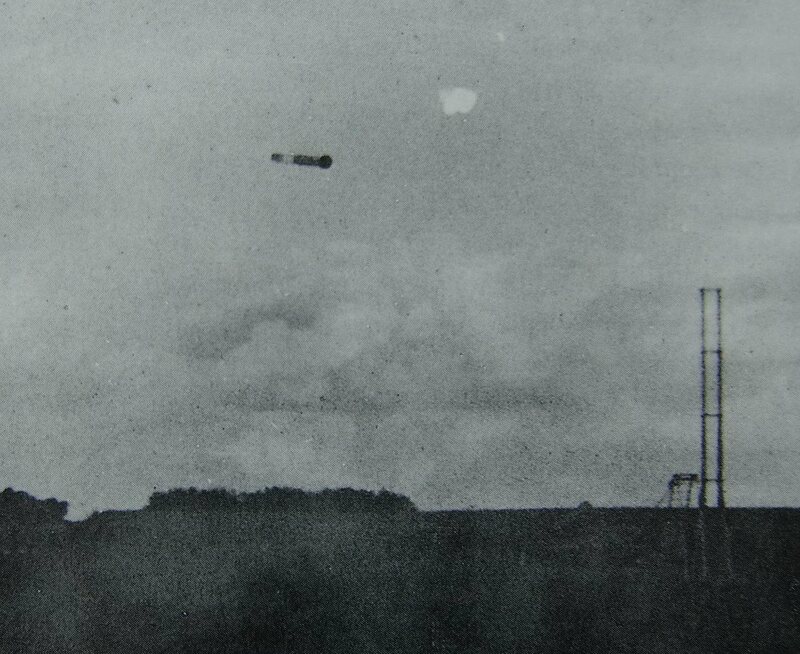 That’s an enormously difficult task and surprisingly late if you stop to think about it: the first rocket roughly large enough to hold a man for a short flight was the V2, and it had its first (partial) success on June 13th, 1942. The first rocket into space (also a V2) was slightly more than two years later, when the MW 18014 launch went 174.2 kilometers up on June 20th, 1944. Yet unless something really unusual turns up in Russian archives no-one ever rode a ballistic rocket before Gagarin. There’s a little room to wiggle in the word “ballistic”, though. John Stapp was the first person to ride a rocket sled in December 1947, as part of a research program on deceleration’s effect on the body. He was restricted to about 150 km/h on that first run, though he’d eventually get up to 1017 kilometers per hour by the end of the program. The sled never actually left the ground, though, so when it comes to “riding a rocket” in the sense being explored here it meets the letter of the law while defying the spirit. You can also make a case for Alexander Lippisch, the designer of the Lippisch Ente, a rocket-powered plane that first flew in 1928. After all, the history of space travel has always been in tension between two approaches, space capsules and spaceplanes—Soyuz or Shuttle. But the latter category throws up a new question: when does a regular aircraft become a rocket? The Ente used its black-powder rockets to gain speed so the wings would generate lift. The first fully ballistic rocket flight with someone on-board was the first test flight of the Bachem Ba 349 Natter, by Lothar Sieber on March 1st, 1945. Unfortunately for us (and very much more so for the pilot) it was only fully ballistic because the Natter went only about 1500 meters up and then crashed before it could switch over to aerodynamic flight—the craft was also a rocket-propelled plane. Closer, perhaps, but still not quite what we have in mind. The other place where we have wiggle room is in “attempt”. If you’re willing to allow projects that never actually got to the point of lifting a person, a few things pop up prior to the Space Age, the outlier of which is the WWII-era spaceplane work of Eugen Sänger—a real spacecraft project but one that was restricted by its ambitiousness to prototype engines, wind tunnel tests, and preliminary blueprints. A little later all three of the Americans, Russians, and British fielded proposals for adapting to manned flight V2s captured from the defeated Axis, none of which got anywhere, and the Germans at least gave some thought to what manned craft they would follow the V2 with once the Nazis won the war. As is often the case with rocketry firsts, it’s the Germans who can take the credit for the first serious attempt to build a manned ballistic rocket. In 1933 there were newspaper reports that the city of Magdeburg had funded a successful manned rocket flight to a height of ten kilometers, the pilot having returned as planned by parachute while his ride carried on to a crash landing in the North Sea. Willy Ley, who was vice-president of the German VfR (“Society for Space Travel”) at the time thoroughly debunked the story both then and a quarter-century later when queried on it during the burst of interest following the launch of Sputnik, but he actually went too far in dismissing it entirely. It turns out that there was a kernel of truth to it, one associated with his own group. Contemporary reports are that a civil engineer employed by the city of Magdeburg, Franz Mengering, had enlisted a member of the VfR, Rudolf Nebel, to build a rocket that could lift a man to a kilometer high and have him return safely to Earth by parachute. The intention was to use it as a publicity stunt for the city, but Mengering was particularly interested in proving the anti-scientific theory called Hohlweltlehre—the idea that the Earth is actually inverted and we live on the inside of a sphere instead of its outside. Ultimately Mengering was hoping to shoot a rocket all the way to the far side of the world that he believed was straight above everyone’s head. He and Nebel convinced the city to fund them to the tune of RM25,000 (US$5950 at the time, or roughly $216,000 in current terms) to build their rocket. Nebel started with a very successful liquid-fuelled sounding rocket of his own design, the Mirak (from the German “Minimum Rakete”) and got to work on a capsule that would be pulled behind a suite of Miraks—he had unusual ideas about the stability of payloads on top of a rocket, as they are virtually always launched nowadays. The result was the so-called “Magdeburg Rocket”, an unmanned prototype of the ultimately planned vehicle with one-third the thrust. There were three unsuccessful attempts to launch the 4.6 meter tall vehicle from a field near Magdeburg starting on June 9th, 1933, but none of them cleared the launch gantry. A fourth on June 29th was relatively more successful but snagged the top of the launch tower and ended up flying sideways for 300 meters. The picture above is from this attempt. Magdeburg’s city officials had seen enough and cut their losses with a RM3200 payment to their rocket builder. Nebel returned to his usual home of Berlin and the VfR’s testing grounds where he reworked the Magdeburg Rocket into something a bit more workable with what money remained. He actually did get it to go up one kilometer as intended, followed by an overly fast splashdown into Lake Tegel (just west of Berlin’s present-day international airport). Ultimately there were nine tests of the prototype rocket between Magdeburg and Berlin by September 1933, at which point civilian rocketry research was cut off by the Nazi government and the planned manned version came to an ignominious end. All for the low price of US$0.99!